Rename your photo collection using meaningful names. Organize your MP3 or iTunes music library with artist, song, album and track numbers. Access the EXIF metadata in your digital photography. Simply browse for files, use our wildcard search, or drag and drop them into the app! The app supports any and all MP3, AAC and Exif metadata tags: the list of available tags is extracted directly from your files. Need to rename directories? Switch to directory mode in the preferences window and you can do just that! Simple, quick, and it'll even put them back where they came from!!! Only took a few minutes to figure out what it was doing and how to get it to do what I want it to do. Read the instructions, and look at ALL the buttons. Heh. Simple. Exactly what I was looking for, and it does what it says flawlessly. i've been using graphic converter for years to rename files. this works exactly as advertised. its perfect for renaming files in folder. easy to use; works like a charm. So simple! Thank you, Thank you! This application was so simple and so fast. Thank youâ€¦. This is an easy app to use compared to trying to find this feature in my photo programs. I don't know what the Presets choice is for, but I just click the rename, put in the name I want and it works. I did have to change some files to "read and write" permissions, as if they are only "read", the program will be blocked. Just used it to rename a bunch of files and I could also move them directly into a new folder and deleted the originial files (if so selected). Great little useful application. 6 stars for me! Very simple and works great. Some little glitches but works perfectly!!! I installed it and was able to immediately begin renaming pictures in bulk. I liked the simplicity and do not need complicated instructions or gadgets when I am trying to get the job done. No issues so far!!! I just reorganized a ton of photos in different folders. Renamed most of them with a few clicks. Would have taken hours otherwise. Five stars because after 4 years having in to do list, I finally cleaned up my Pictures Folder! 5 stars. excllent. magnificent. heroic. oh, and i dig your work too. =D Rodney! Seriously, it works perfect when items are copied to a desktop folder for conversion. Price point is excellent too. Nice job! Easily renamed large number of .mpo files for use with nintendo 3ds. This is the only batch renamer I have ever used , I have never even tried any other, and I am not going to. This program does just I want it to do. I have looked others, then I thought "for the price why bother". 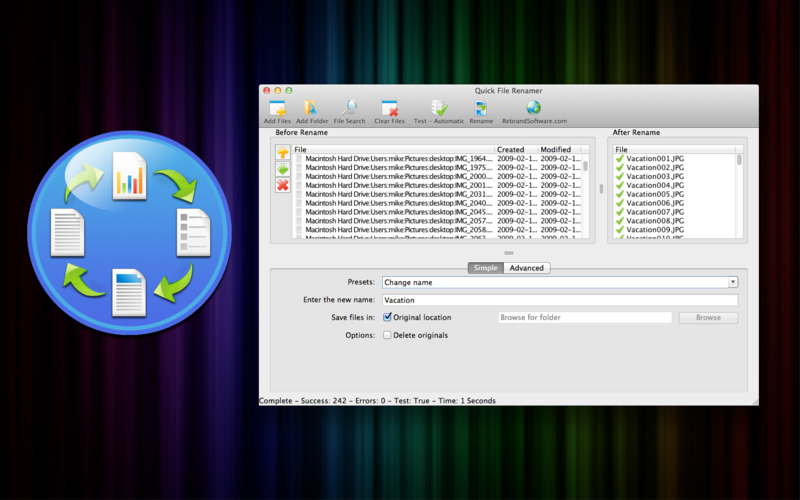 For those times when you have a bunch of files that need renaming, Quick File Renamer gets the job done. It provides a number of ways to target files and get them named the way that you want them. I have just bought a copy for my Windows PC having used it on Mac for a couple of years. Brilliant and excellent value.